Star Wars is one of the most beloved franchises in history. The original three films are considered some of the most impressive science fiction movies of all time and that has led to a passionate fan base the world over. When the series came back to tell Episodes one through three, the prequels were met with mostly disappointment. When Disney purchased the license from George Lucas in 2012, fans were once again hesitant and yet curious to see what the House of Mouse had in store for the franchise. Their first film, The Force Awakens, was critically well received, even if it did borrow quite a lot from A New Hope, yet it seemed that Disney had put the franchise in good hands. Despite the prequels not living up to many fans' standards, I quite enjoyed them. While I do agree that The Phantom Menace is a rather poor film; Attack of the Clones and Revenge of the Sith were enjoyable adventures, at least to me. Characters like General Grievous and Ewan McGregor's Obi-Wan Kenobi were fantastic and these movies eventually led to the creation of The Clone Wars animated series, my favorite content of the Star War franchise. This series also introduced us to Ahsoka Tano, my hands down favorite Star Wars character of all time and one begging to be included in a live action film in the future. Disney's second film, Rogue One: A Star Wars story, was released last year, telling the somewhat untold tale of how the Rebellion gained the intel to destroy the first Death Star. I was a huge fan of the film and found it to be quite entertaining. 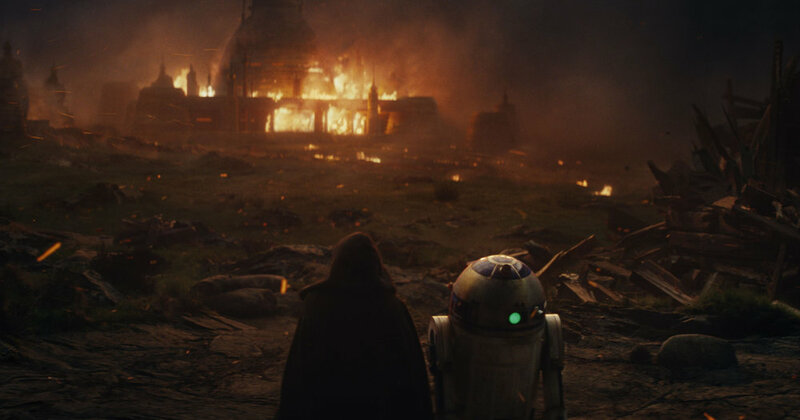 Both The Force Awakens and Rogue One felt like traditional Star Wars movies and didn't include content in each film that would contradict the tone and feel of what we expect from a film in this franchise, which is why the latest film, The Last Jedi, doesn't fit tonally with what has come before it. This is mostly due to the excessive humor that is littered throughout the film. Because of this, The Last Jedi is merely a good film and never quite reaches towards greatness. I won't be diving too far into spoiler territory and will be somewhat vague on certain events to avoid ruining any moments in the film. The Last Jedi essentially follows three plotlines throughout the movie; Rey and Luke, The Rebellion and the First Order, and the events surrounding Finn and Rose, the latter name being one of the new characters in the film. The relationship between Rey and Luke is probably the strongest part of the movie and each character contributes to the two best moments in the film. The Rebellion and the First Order moments are fairly entertaining but feature some really poor storytelling moments that are a bit bizarre in their reasoning. This arc also features a pretty amazing moment that left nearly everyone in my theatre speechless. The remaining plotline for that of Finn and Rose felt wasted and frankly, boring. Had this arc been trimmed up and more focused, then maybe it would have worked in respect to what I think they wanted from it, but it just kept going and packing in more and more elements that felt wasted here. This arc also made me wonder if they didn't have much for Finn to do, except for a key moment late in the film, he feels entirely wasted here. The Last Jedi is largely focused on Rey and Luke, however; there is actually quite a bit for Kylo Ren here as well, as you learn more of the backstory as to why Luke went into seclusion and why Kylo Ren went to the Darkside. I found one element between Rey and Kylo Ren to be sort of a cheap way for the characters to interact that felt somewhat lazy in its conception but considering where each character is during the majority of the film, I'm guessing it couldn't be helped. While Snoke appeared in The Force Awakens, he did so via hologram and it's here in The Last Jedi where we actually see Snoke in the flesh. Despite all the mystery surrounding the character that grew after his introduction in the previous film, Snoke was really a disappointment. Had the film dived further into the past of Kylo Ren and showed how Snoke lured him to the Darkside, then maybe Snoke would have been more of a presence here, but the way in which the character is used was far less impactful than I was anticipating. Daisy Ridley, as Rey, is still my favorite part of this new trilogy and she nails every scene she is in. She has a very powerful moment that leads to a fight that may very well be the best moment in the film. Her talents as a force user are tested to a remarkable degree and the franchise is betting very heavily on the young actress. Her chemistry with Mark Hamill is great and the two play off each other rather well. It was great to see Mark back as Luke, but given this is a very aged Luke Skywalker that left much of his old life behind, it does feel like a different character at times. That being said, when Luke shouts out to R2D2, he does so with the same excitement he brought in the previous films. The remaining cast is serviceable but rarely does anyone stand out. Laura Dern as Vice Admiral Holdo didn't really work for me and I didn't find her to be a good fit for the series. Oscar Isaac's Poe Dameron is ok but I enjoyed him far more in the previous film. As Carrier Fisher passed away before the film released, many were left wondering how the film handles her passing, and frankly, they did a remarkable job here. It was said that Leia has a substantial role in the film and they were not wrong and Fisher is involved in many aspects of the story. The newest character, Rose, has her moments but the boring arc she and Finn are on during a solid chunk of the movie made me somewhat blah on her role here overall. I also felt that Domhnall Gleeson as General Hux is easily the worst actor in this film as nearly every scene he is in is overacted to an absolutely insane degree. I kept hoping that someone would drive a lightsaber through him, but sadly, no one did. Benicio Del Toro's character, DJ, has the possibility of being something cool in the series, but that potential is only teased to us here. I enjoyed what there was of him, but again, wasted potential thus far. While humor isn't foreign to the Star Wars franchise, it certainly wasn't so in your face and goofy as it is here in The Last Jedi. Nearly every few minutes the film attempts to get a laugh from its audience due to scenes that are not naturally funny. These moments are gags and goofs that don't feel like they belong in a Star Wars film. I'm not sure if Disney was attempting to cash in on the humorous aspects of some of their Marvel films, but the tone of the Last Jedi just doesn't mesh well with The Force Awakens, making watching them back-to-back a very unbalanced viewing. The movie also has many lapses in logic and story elements that just don't work, but that would require a spoiler discussion as to why these moments failed to impress or even make sense at all. The elements that make a good Star Wars film are here and when the movie acts on those it is a solid film. Director Rian Johnson, unfortunately, ruins the feel of a proper Star Wars film by stuffing it with non-stop goofs that don't have their place in this beloved franchise. This film has been very polarizing as while there are many who enjoyed the movie, there seem to be far more that hate it, with even a petition started to have it wiped from canon and remade. While I don't think the film is bad enough to go through with all that, it certainly is a very weak film when compared to what has come before it. The Last Jedi also makes a few bold choices in how the canon will go forward and is betting very heavily on much of its new cast. I still don't believe that Rian Johnson was a smart choice to helm this movie and the fact he is currently at work developing a whole new Star Wars trilogy has me very cautious about the future of the brand.